Things Get Painted - WIP - Chaos Warrior from a long forgotten time. I've started some challenges on the OzPainters forum, and this month the challenge is to paint red. Just after it started (yeah, I picked a topic with no specific target for myself, which was fun) I realised I had picked up a classic chaos warrior at a bring and buy (possibly last years EucBowl). Chaos Warriors are red, because the only God worth following is Khorne. Right? 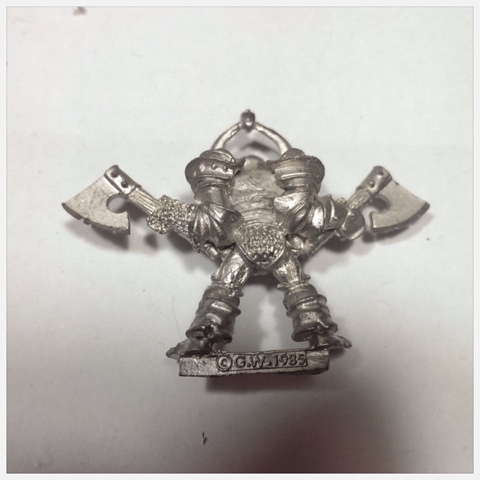 The top right are metal filings from a Privateer Press model I'm working on at the moment. The bottom left, you may notice is a duller grey colour. This model contains lead. That's a blast from the past. I built the base up using my usual tricks, and gave him a white undercoat to prep him for painting on Sunday. A few quick snaps of the McMourning crew. I want to get more used to doing a bit more painting each night so I can start spending more time at the desk. 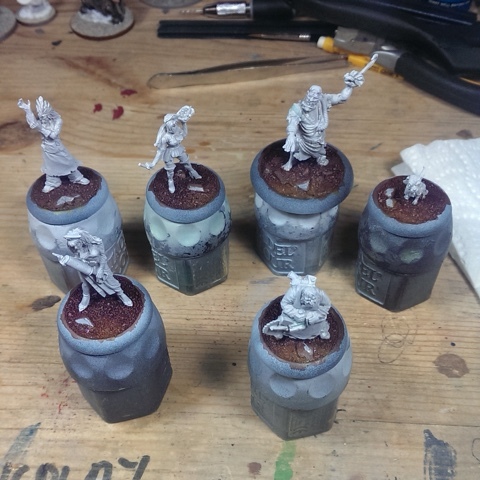 All the models were under coated white so that I could start on the bases tonight. Because I was using dry rushing there, this meant I didn't have to be bothered with accuracy later on in the job. The bases were flooded with brown ink, and while they were still wet there as a dark tone applied to the back, and a yellow applied to the front. Even once it's dry rushed, it gives a really subtle impression of the front and back of the base. The stones were blocked in, given a few washes, and stippled with line highlights to complete them. The final stage of the painting will be the black base edge, and after a varnish I'll do some grass tufts. Things Get Painted - WIP - By Order Of The Governor's Secretary! Cardinal rule, I think, for anyone that wants to compete in miniature painting comps regularly, should be:"Don't start a new project within a few months of a competition." 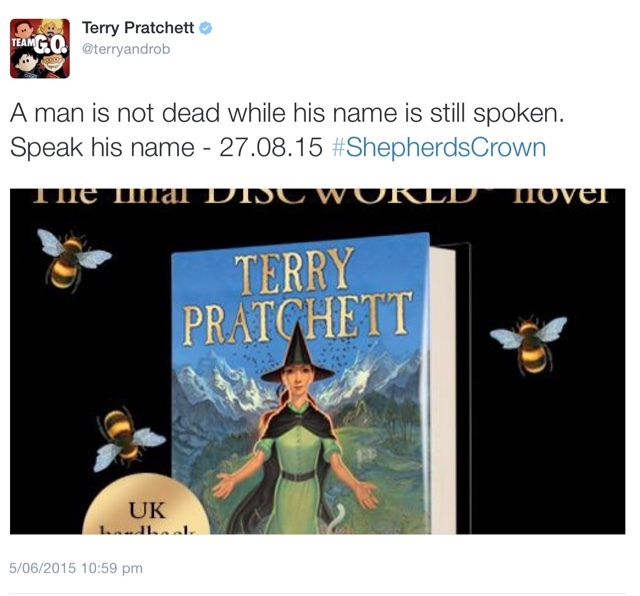 Further to that: "Don't start an tabletop level project, that will confuse things." 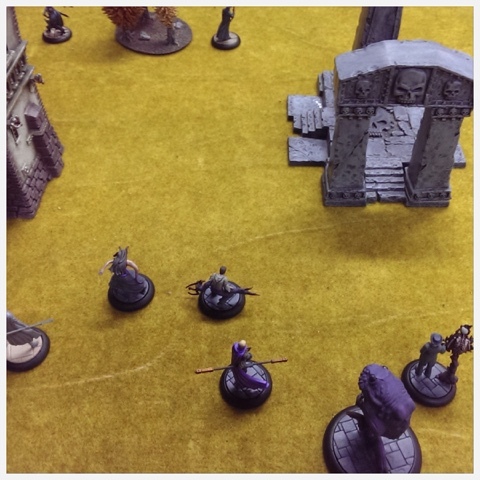 The downfall of this is: "These old metals are cheap..."
Things Get Played - Victory in Malifaux! I won a game of Malifaux! Well, technically it was a win by my opponent conceding, but he was basing that choice in maths, which I seem to be ok with. We elected to try the Evade the Patrol story encounter from Wyrd Chronicles. I ended up as the defender, having to keep my crew out of site of his Master and Henchmen. He was the attacker, having to stay away from the Guild patrol. As luck would have it, he had two unused Guild Guard, painted (as is the rest of the crew) by AdPaint. I have somewhat mixed feelings about this, and I guess for mostly positive reasons. 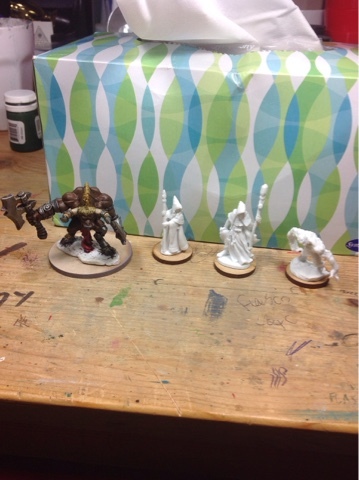 So, a quick update.ive been painting some bones minis recently. Nothing special, but just trying to get some cleared from my backlog, as well as getting them more useable for DnD. 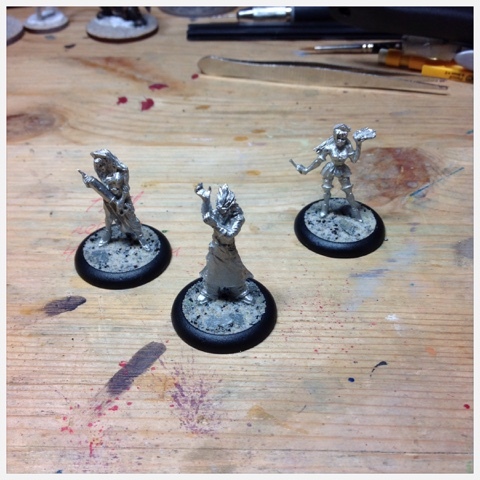 A few weeks ago, the reaper miniatures Facebook group had a tip in there about freezing bones models to make them a bit more brittle temporarily, and then using that opportunity to remove mould lines. They also suggested using a GW Seam scraper to remove the lines. A friend of mine tried it last week, and the results were really good. I tried it without the scraper the other day and was impressed. So when I got my hands on one of them tonight and gave it a go, I was really happy!